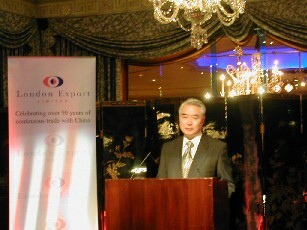 I am very pleased to be invited to the Chinese New Year Dinner organized by London Export. First of all, on behalf of the embassy, I would like to express my sincere thanks for your kind invitation and warm hospitality. In March, the National People's Congress elected new leaders of the state and government. In Spring, Sars broke out in China. By relying on science, by mobilizing the people and with international support, China successfully brought Sars under effective control, within a relatively short period of time. Despite of the negative impact of Sars, the Chinese economy has maintained a good momentum of growth. The growth rate of China's GDP stood at 8.5% last year. It was pushed by investment, domestic consumption and exports. Last year, China's foreign trade reached a record high of 851.2 billion US dollars, making China the No.4 trading nation in the world. The economic structure has been further improved. The efficiency of the economy has been greatly enhanced demonstrated by the rapid increase of enterprises' profits and national revenue. The national tax revenue went up to more than 2000 billion yuan. A Decision on Further Improving the Socialist Market Economy was adopted at the 3rd Plenary Session of the 16th CPC Central Committee. Further reforms in various fields were carried out in an orderly way. To the great joy of the Chinese people, China successfully launched its first manned spacecraft last October, realizing the long-cherished dream of putting a man into space. Although, China still faces all kinds of challenges and difficulties ahead, the past success has given us greater confidence to realize the goal of building a well-off society in an all-round way and quadruple China's GDP of 2000 by the year 2020. Both Prime Minister and Deputy Prime Minister paid a successful visit to China respectively. They had good discussions and reached important understandings with Chinese leaders. On our side, Vice Chairman of National People's Congress Mr. Wang Zhaoguo and Foreign Minister Li also paid successful visits to the UK. The scope and depth of bilateral consultations on major international and regional issues have been further expanded. For the first time, China and UK had successfully held the strategic consultations at vice-ministerial level. Bilateral economic and trade cooperation got further strengthened. The two way trade increased at least by 20% last year. Mutual investment is becoming more active. Exchanges in the field of culture, education and science and technology have displayed great dynamism. People to people exchanges have been on the increase. I've noticed that there is a growing interest in China among British people. They all want to learn more about my country. All these developments have laid a solid foundation for further development of China-UK relations in the years to come. 1. The pace of economic development has obviously accelerated. The growth rate of GDP in the past 3 years in this region has been higher than the national average. This is something quite unprecedented. 2. The infrastructure of the region has been greatly improved. The Qinghai-Tibet Railway is expected to be finished by 2007. The construction of the west-to-east gas transmission pipelines and the west-to-east power transmission project has made great progress. By the end of 2003, more than 30 water reservoirs, 1641 miles of railways and 31 airports have either been built or expanded. 98% villages and townships now have access to electricity. Radio and TV coverage has reached more than 97% household. Telecommunication is just as convenient as in coastal provinces. 3. The ecological environment has seen big improvements. Due to China's geographical feature, the major rivers-Yangze and the Yellow River, are all originated from the western region. Therefore, the ecology of the western region holds great importance to China's sustainable development. In the last 2 years, the projects of restoration of grassland, conversion of low-yielding cultivated land into forest and pastures have achieved marked results. 4. The outlook of the cities and rural areas has experienced great transformation. For example, Shihezi, the city in Xinjiang Autonomous region I visited last year was just a bleak desert 50 years ago. Now it has become one of the beautiful "Garden Cities" in China. The Chongqing city with all the newly built modern buildings is hardly recognizable since I last visited it in 1986. 5. People's living standards have been greatly improved. Even in the most remote towns and villages in Tibet which I visited the year before last, I found out there were many new houses and all the shops are full of various kinds of consumer goods. We do recognize that due to historical reasons, there still exit a big gap between western and eastern part of China in terms of economic and social development. We are fully aware of the challenges ahead. For instance, the per capita GDP of the western region is still about one third of the coastal region. The implementation of the Strategy would be a long term task which requires efforts of generations. It is worthy to point out here that the western region also has many advantages in development. It occupies 71% of China's total area with abundant natural resources. It has also 28% of the country's total population. The population of one province-Sichuan equals to the whole of Germany. There are great potentials to be explored. 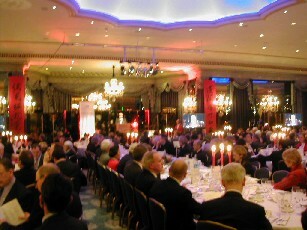 I believe the western development strategy has offered new opportunities for China-UK economic and trade cooperation. In recent years, we have seen more and more foreign investments going to western China. More than 100 of the world's top 500 companies have invested in this region. I certainly hope that British entrepreneurs can grasp the opportunities, have a better understanding of the western region and actively participate in its development. Finally, I wish all guests present tonight a happy Chinese new year, good health and great success in the year of the Monkey.